The Reasons You Should Learn Chess with "No Stress Chess"
For the absolute beginner, there’s no better way to learn than with No Stress Chess! No Stress Chess is an innovative new product for beginning chess players that helps them to learn the game without all the, well, stress! 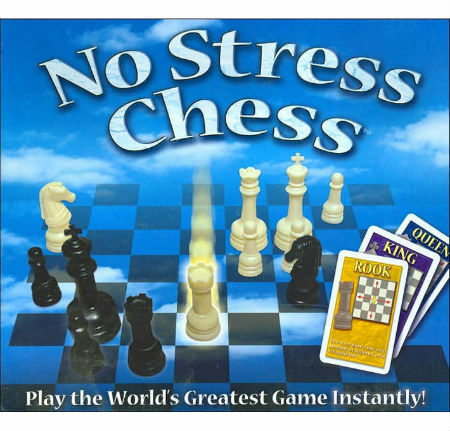 The makers of No Stress Chess game understand that chess can be somewhat of an intimidating game to pick up. People who are interested in learning chess are often dissuaded or held back by their fear that it will be too much to memorize all at once, or that they’ll never be able to get really good at it. No Stress Chess helps to soothe these fears by employing a unique system of Action Cards that guide the player along each step of the way. Who Is No Stress Chess For? The No Stress Chess system is designed for younger players, but there’s no reason that adults can’t benefit from it just the same! In fact, the box lists this product as being suitable for ages 7 and up. More important than your age is your level of experience with chess. This product is truly for the absolute beginner. It is designed to teach the names of the chess pieces, where they each go on the board, and how they move. It covers the very basics of how to play chess, and nothing more. If you already know those things, you won’t get much out of this product. 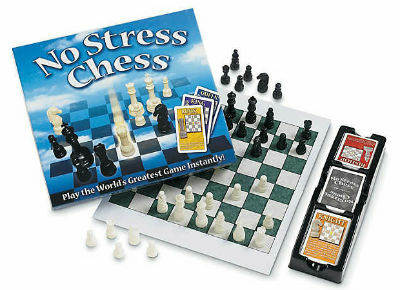 The No Stress Chess kit comes with several pieces that aren’t usually included in a regular chess set. 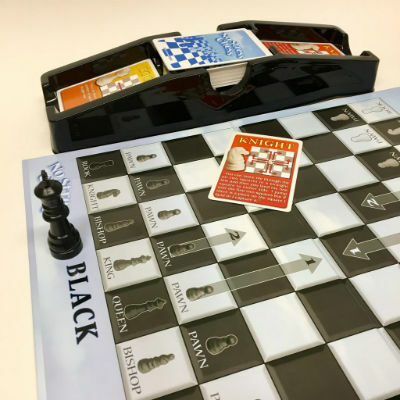 Of course, it has the playing surface and a full set of Staunton style chess pieces, but it also includes 56 action cards, a card tray to hold them all, and a double-sided chess board with illustrations. These unique elements are what set the No Stress Chess set apart from all others and make it such a valuable learning tool. Right from the start, the No Stress Chess product makes things easy for you. Not only is the chessboard labeled with which piece should go on which square, but it also has the Black and White sides labeled so that there’s absolutely no confusion during set up. The No Stress Chess action cards help to solve some of the new chess player’s most basic challenges. First of all, new players often have trouble distinguishing one piece for another and recognize which piece is called by which name. Also, very often those who are interested in chess say that they’d like to learn or they’ve tried to learn before, but they just couldn’t remember the movement rules for all of the pieces. 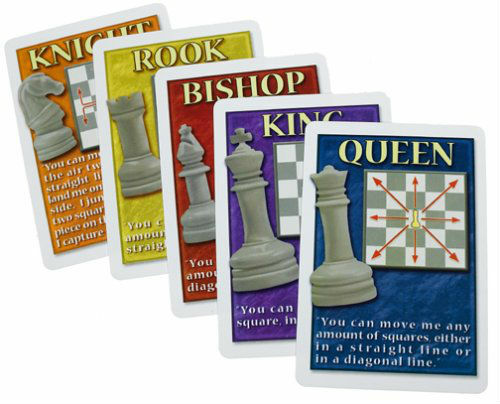 No Stress Chess game eliminates these common problems by supplying cards for each piece that include a picture of the piece, its name, a diagram for its movement patterns, and a few lines of description telling you exactly what you can do with each piece. These cards are an excellent resource for any beginning player that can really accelerate the learning process. In fact, there are probably some seasoned players out there that would like to get their hands on these cards! Of course, that only accounts for a small number out of the 56 available Action Cards included with each No Stress Chess set. The remaining cards serve a different purpose, and there are different ways to use them based on how far you’ve advanced in the program. The first level of play is quite simple, as it should be. Basically, each player will draw a card on their turn and perform the move listed on the card. This takes the strategy part of chess out of the equation until you master the basics of how to move the pieces and become more comfortable with that part of it. We think it’s a clever system since it allows players to start playing right away, without having to complete extensive instruction. With No Stress Chess, you learn by doing. Once you feel comfortable with that, you can start playing with a hand of 5 cards for each player. This allows each player some control over which moves they make and when, but they’re still limited by the moves listed on the Action Cards they have in their hand. This introduces a bit of strategy in a little bite-sized piece that’s easy to swallow and non-intimidating. When you’re ready, you can flip the chessboard over to the non-labeled side and play a regular game of chess without Action Cards! What Skills Will You Learn with No Stress Chess? No Stress Chess walks you through all the basic skills needed to gain a fundamental understanding of chess. It builds confidence in beginning chess players by providing them all the information they need to play the game on easy to reference Action Cards. The system teaches players which pieces are which, where they go on the board, and how they each move. All the basics you need to begin! The No Stress Chess system is not designed to teach chess strategy, only to cover the very basics. But what it does, it does well, and there are plenty of other resources available for deeper learning once you outgrow No Stress Chess. The No Stress Chess system designed to cover the very basics. With the amount of educational chess materials that are available today, it’s surprising how unusual it is to find a product aimed toward the absolute beginner. No Stress Chess fills that niche and does it well. With its super low price tag and effective approach to teaching chess to beginners of all ages, there’s really no need for any other product! There’s no doubt that No Stress Chess will whet the appetite for more chess, so when you or your child finish the program, you may want to purchase a little “graduation present” of sorts in the form of a new chess set. Themed Chess Sets are a great choice for children, or if you want something a bit more luxurious for yourself, you can always check out our reviews of The Best Chess Sets on the Market. Best Chess Sets: Our Reviews List of The Best Chess Sets of 2019. Antique Chess Sets: List of The Best Antique Chess Sets on the Market. Mammoth Ivory Chess Set: List of The Best Ivory Chess Sets for Sale in 2019. Wooden Chess Sets: Reviews List of The Best Wooden Chess Sets Online. Cool Chess Sets: The Coolest And Most Unique Chess Sets Online. Civil War Chess Sets Reviews: Reviews List of The Best Civil War Chess Sets of 2019. Mario Chess Set: Review of The Best Super Mario Chess Set Online.